Zetsuen no Tempest draws heavily on two Shakespeare plays, Hamlet and The Tempest. The series was simulcast on Crunchyroll. Nothing could say more about Blast of Tempest than Shakespeare’s The Tempest which is heavily referenced throughout the series. Blast of Tempest is a story about overcoming entrapment in the past, both figuratively and literally. One thing that can be said about Blast of Tempest is that it follows a logical premise that manages to feel legitimately inspired despite its fair share of twists. Even though the story involves magic, the series defines a strong logical framework that both empowers and entraps its characters. Above all, our character’s personal history is a major factor in the series. It drives Mahiro on a vengeful path to determine who killed his sister and weighs down Yoshino to the point of near-detachment. It is only when these characters are able to accept fate and focus that they are able to allow a tragic event to become the means to a better end (saving the world). Moreover, past as a general influence is extremely well-realized. Events in the past, including Hakaze’s imprisonment, Aika’s death, and even further back to the formation of the Tree of Exodus as a means to end the Tree of Genesis’s purpose in resetting humanity are central to the plot. Furthermore, the notion of order and chaos is thematically prevalent in the series. Even though the Tree of Genesis represents order, it is only with the chaos represented by the Tree of Exodus that humanity can thrive and even exist. Despite the resurgence of crime and inequality after the dissolution of the Tree of Genesis, it is easy to understand the necessity in the action and why the order imposed by the Tree of Genesis would eventually deem all of humanity unrighteous. The only major flaw to Blast of Tempest‘s story is that it tends to use its characters as if they are actors in a play (perhaps intentionally). Each character plays his part, often without question. This is extremely noticeable in Aika’s casual acceptance of her fate despite what clearly would have been a difficult decision – but this may actually speak more to her character than to the show’s tendency to have its actors fill a role. Character development is very important in Blast of Tempest - and all of its main characters, Hakaze, Yoshino, Mahiro and Aika, are a strong basis to the show’s central themes despite their differing personas. What enforces their strength is their intelligence – even in Mahiro’s case – the characters carefully and cleverly plan their actions. Hakaze is a strong female lead that is open and direct, while sometimes being too upfront and occasionally becoming distracted by desire. What defines Hakaze the most is that, despite her attunement to the Tree of Genesis, she is far from unquestioning. Her actions are often fueled by her desire to seek her own path, even with opposition or without knowing the consequences. It makes her into a character nearly embracing chaos despite the order surrounding her – which accentuates her foil in Aika. Aika, though appearing frail, is strong to a fault. Her character embraces the ideology of Exodus far too unconditionally which is but testament to her acceptance with being an actress in a play. She often quotes Hamlet and The Tempest because she feels that her only goals have already been previously scripted and she must play to those ideals. Mahiro, on the other hand, represents another extreme of chaos with his absolute path of vengeance. His early ambitions are simply to avenge the death of Aika, but this actually drives him to greatness because of her involvement in much more crucial matters. When he is freed from this path, his goal has actually become to enact a plan to save the world. Mahiro is a renegade without being overly reckless and ambitious to a point where he is not clouded. Yoshino, for a large majority of the show, is very detached. Aika’s death had an opposing effect on him in that he nearly lost desire to function after her passing. Even though he is tied down by her loss, he thinks clearly and keeps Mahiro in check when he is pushing himself too far. It’s important to note that Yoshino is the last character to resolve his past as a lesson in history, because he is too entrapped by it. Hakaze’s confessions to him cause him to break because he is not ready to continue his life until all others’ problems have been resolved. Blast of Tempest is breathtaking visually and its usage of classical pieces in its soundtrack is excellently done. By now, this is what we expect from BONES, so it isn’t too unbelievable that this show lives up to BONES’s capability to generate quality in its production value. Particularly of note are the show’s excellent action scenes that accentuate brilliant animation along with well-utilized classical music. 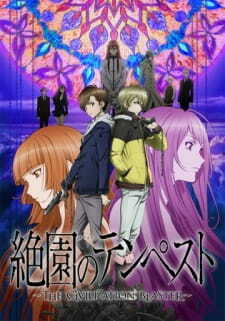 While Blast of Tempest occasionally falls short of absolute excellence in its willingness to allow its characters to fill roles, it presents a story of past entanglements that is very well-realized and non-contradictory with a cast that synergizes their differing viewpoints. Zetsuen no Tempest is an action/supernatural/shonen anime by studio Bones, known for its previous works Eureka Seven, Fullmetal Alchemist, Star Driver, etc. Tempest starts out as a very promising shonen anime with interesting characters and an elaborate setup in a world full of turmoil. Preferring to skip the dramatic buildup, Tempest throws you right into the action and chaos right from the very first episode. Its steady pacing keeps the viewers on the edge of their seat and eager for more of the story. It’s too bad that Tempest doesn’t keep this up for the whole series. Halfway through, the show takes a serious dip in quality in just about every area, aside from maybe animation and sound. And it’s a shame because Zetsuen no Tempest had so much potential, but it falls flat on its face instead. But let’s talk about the good of this show first. The art and animation are top notch. Studio Bones pulled no punches when it came to the gorgeous animation and character designs. The battles are fast, fluid, and intense, going hand in hand with the spectacular and vivid wheel of colors that enhance the magical effects. The character designs are stylish and unique, with no two characters looking too much alike. Another small little detail that was well done was the character’s clothing. Each character’s various clothing looks like something straight out of a teen fashion magazine; very funky and stylish. Small artistic details are also added in the character’s hair and accessories. If I were rating this anime solely based on its art and animation, it would easily score a nine at the very least. Unfortunately, I did not, and I won’t. Now on to the not-so-good of Zetsuen no Tempest, which is basically everything else. Perhaps the weakest aspect of the show is its story. The story starts out with Hakaze Kusaribe, the princess of a clan of mages, contacting Fuwa Mahiro to help her extinguish an uprising instigated by her followers. Left stranded on an island by said followers, they can only communicate through magic. Hakaze promises to help Mahiro find his sister’s killer in exchange for his help. Mahiro’s friend, Takigawa Yoshino comes along for the ride, and together the three aim to prevent the Kusaribe clan from awakening the tree of Exodus, which would subsequently bring destruction to the entire world. The entire story pays homage to Shakespeare’s works, namely The Tempest and Hamlet. For some reason, the story feels it needs to remind you of this quite frequently, as it seems every few minutes someone is throwing out a Shakespeare quote. There’s no subtlety in its delivery, and the quotes have little meaning to the plot or the characters. It seems they simply threw in several quotes in order to make the script seemed more grand and classy. Instead, it ended up making the entire anime sound incredibly pretentious. It could be argued that the two differing plays were being quoted to signal that this anime could either have a happy or tragic ending, leaving the viewer to wonder in anticipation. But not only is that grasping at straws, it gives the writers more credit than they probably deserve. Now to be fair, the first half of the series was pretty good. It was standing on shaky ground but it was still quite good. It may have been standard shonen anime fare “save the world with magical powers, stop the bad guys” but it had an interesting enough twist to keep it afloat. The characters were interesting; they had clear cut motivations that at least made some sense. The plot moved about at a comfortable pace with just enough action and character development shimmied into each episode. The rules of the universe made sense. All that was completely ruined by its mess of a second half. The plot begins to contradict the rules it established in its first half. It makes no effort to even make sense of Hakaze’s ability to time travel for a second and third time. It presents a ridiculous plot twist that makes even less sense and gives a sort of barbaric edge to Aika’s character that the other characters don’t even bat an eye at. And worst of all, romance is shoehorned in for the sake of throwing in some aspects of a corny school love comedy. Hakaze even alludes to this in a hilarious 4th wall breaking internal monologue. Perhaps one of the most disappointing aspects of the show is the degradation of its characters. Yes that’s right, the very characters that made the show go backwards as it drags on. Perhaps the character that does it the most is Hakaze Kusaribe. She is initially presented as a strong heroine, with an arrogant edge that is backed up by her standing as the most powerful mage in the clan. She is cunning and unflinching, yet kind and caring when she needs to be. But of course that is all negated when she falls in love. Yes, LOVE! She becomes clumsy, indecisive, and silly at the first hints of love. Her initial goal was to prevent the destruction of the world and take control of her clan once again. But when she falls in love, she leaves the fate of her clan in the hands of the guy who betrayed her and sent her to an island to die. All so she could travel freely with her love interest. Later, she wants to save the world simply for her love. To say anything else about her silly love driven mindset would mean spoilers, so to be vague, pay attention to what she says when she travels across time a second time. It is so unbelievably silly, bordering on completely idiotic. She goes from a strong heroine to someone whose sole reason for existing and acting is for her love. Maybe it wouldn’t be that bad it we had some substantial buildup to the relationship, coupled with proof of an established and long-lasting bond that could never be broken. That, and if her feelings were actually reciprocated. Then it would be quite romantic and heroic that Hakaze would do anything for her love. But instead, her actions are based on a silly schoolgirl crush (that quite literally springs out of nowhere) and nothing more, making her actions and motivations seem incredibly idiotic. Fuwa Mahiro and Takigawa Yoshino are perfect foils, making for a very interesting relationship between the two heroes. They get a significant amount of development in the first half of the show through a series of flashbacks, some of which involve Aika. Brash and arrogant Mahiro is the brawn of their duo, while the manipulative and analytical Yoshino is the brains. Their relationship is one of the most interesting ones of the series. How two young men who are so different from each other could end up cooperating so willingly and becoming the best of friends is a real mystery. But their actions in the second half become a bit odd to say the least. Not only that, but they show little emotion when finding out the truth behind Aika’s death, despite the fact that they are the most important people to her. In fact, their lack of emotion is prevalent even in the first half. They are just normal high school boys, not hardened soldiers. Yet their reactions to the destruction of their home certainly don’t give any hints to that. Then there is Fuwa Aika, one of the most confusing characters. She’s already dead by the beginning of the series, yet still plays an important role in the story. She’s the motivation for Yoshino and Mahiro’s actions and appears in numerous flashbacks. Her character is described in the anime as having a “horrible personality.” That’s not even the half of it. Her development at the tail end of the series hints at a facet of her personality that is far more barbaric, border lining on psychotic. The rest of the side characters are mostly just there for decoration. They are lively personalities to either spice things up or be used as a convenient plot device to move the story along. Now don’t get me wrong, Zetsuen no Tempest is not wholly unwatchable. There is plenty of enjoyment to be had watching this series, especially during the first half. It’s just too bad that Bones screwed up the story and characters so hard during the second half that it irredeemably sours the entire series. The character’s motivations during the second half make little to no sense. And trying to piece together why the characters are doing what they’re doing gives way to the realization that these characters are acting like total idiots. The plot twist during the second half was also ridiculous, giving the viewer little justification for WHY things had to be this way. Not to mention the implausibility of the situation based purely on the rules set by the anime. Zetsuen no Tempest is a great watch if you turn off your brain and just enjoy it for what it is: Your “only very slightly above average until the second half of the show” shonen anime. Anybody looking for anything more won’t get much enjoyment out of this anime. How should I say this... This anime was one of the best that I've seen. Whenever I have nothing to watch, I would turn to Zetsuen no Tempest (Blast of the Tempest/ The Civilization Blaster). The ending was perfect, the story line was amazing, but the best of all were the characters. Story: The story was put together in a great yet questionable way. There were many parts of the anime that could be related to the famous works of Shakespeare. With plot twists that would leave you confused, the story was never boring. The twisted tale of love, hate, revenge and a touch of magic was most definitely satisfying especially how the ending wrapped up the entire story. I sincerely wish that they would make a sequel. Art: The art was satisfying, it clearly showed details in the magic shields and barriers. They point that stood out the most for me were the eyes. The characters eyes showed their emotions so clearly that they sent shivers down my spine, how they would dull or brighten depending on the emotions being conveyed. Sound: The music chosen for this anime was.... Fabulous. The violin solos with the varying volumes matched the pace of the show and the suspense in the best fashion. The opening and endings weren't boring and they definitely didn't reveal a lot about the story. The upbeat openings shows the action and the more aggressive emotions in the show whereas the slower themes in the endings portrays the more negative and deeper feelings. Character: Gosh, all of the characters were so perfect. They each played a huge role in the story but I think I should be more specific. Takigawa Yoshino is my favorite character, he is so mysterious and he definitely is a major character. He is referred as Horatio in some parts of the anime. His tale of not being able to grieve for the one he loves is heart breaking, how he shows great deduction skills and how he seems so innocent is so twisted and yet it fits the story perfectly. Fuwa Mahiro is the rich and feared character. His feelings played a large role, I find his motives very amusing throughout the plot. Yoshino and Mahiro are very... different characters compared to the cliches that show up nowadays. When you expect them to do something, they do the complete opposite. But what scares and surprises me the most is the lack of response from the two of them, no matter what they can always appear calm. Yet, in some ways, they always seem to come back from the past and continue to be part of your lives. It's like when you go through a photo album and you see that one picture which strikes you the most. You take out that picture and examines it carefully and take a trip down memory lane. However, in this series, that memory lane isn't a happy memory. No, in fact, it's one ride you wish you'd never had taken because from that event, things are never the same again. Zetsuen no Tempest (also known as Blast of Tempest) is an anime series adapted from the manga of the same name handled by Bones. The studio is already known for some of their other works with the supernatural/super power themes such as Full Metal Alchemist, Darker than Black, and Star Driver. Their latest title in their line of evolution of works is this little gem. Written by Kyou Shirodaira, the series follows the aftermath involving lives of two best friends after the events of a tragic past. To uncover the mysteries of the past, they seek the help of a powerful magician and with their help might find the answer they are looking for. At the same time, it's up to the duo to stop a mysterious clan on the horizon to prevent the end of the world. On the surface, there are many questions that seems to need answers not only revolving for the main protagonists but for ourselves as well. It's no surprise there is so much mystery involved either considering the author of the series is also involved in another mystery title, Spiral: The Bonds of Reasoning. The pilot episode suggests this with introduction of the main characters and a small glimpse of their mysterious past. Curiously enough, we also see the “mage in the barrel” (as the pilot episode suggests) that may make us scratch our heads a bit more. In fact, we can even see blood and tragedy already from the backgrounds. Furthermore, there seems to be a barrage of butterflies roaming in the air as well as the monotonic speeches from the main protagonists. To add to the package, we have some action including a dark haired beauty, shounen-style action gags, and a seemingly civilization that is in ruins for God-knows-what reasons with a touch of magic. All sound mind bobbling, doesn't it? For some reason, it's how the series begin and towards the ends it shows the dark revelation of a tragedy. In order to embrace on what's to come, it's imperative to watch the series with some insight and with your brains focused on more than just the pretty visuals. Oh but visuals itself doesn't just represent Zetusen no Tempest. It's a bit more than that. For fans of Shakespeare, this could be a delight of those into his literature. As a matter of fact, a few of the dialogues and characters may represent his works themselves. For example, the term “Tempest” could be a homage of Shakespeare's work of “The Tempest”, which was assumed to be one of his last creations. The themes from that play such as an island setting, magic, and those bits of romance suggests this and be converted into modern times. It's quite appealing to watch though as most of us who attends those boring English classes at high school and sleeping through discussions (you know who you are) might get a pleasant surprise at this series. If not, well then, tough break. The plot of the series seems to be quite attractive not only with the mysterious backgrounds but also the way it is presented. The Tree of Exodus seems to play a prominent role to determine the fate of the world by the way everyone tries to learn and awaken its power. It can also be implied that the Tree of Exodus may be a key to unlock the main protagonists' past tragedies and the truth they are looking for. Nevertheless, it is definitely important since everyone wishes to get to it before the others. The mysteries surrounding the plot seems also revolve around the purpose and true origins of that tree. Why was it there? What is its power? And how did it came to be are just a few of many questions that the viewers may ask themselves when progressing through this series. There also seems cases of government conspiracies and conflicts between clans with its fellow mages. All of this spells out the word confusion (it sure did for me!) in the first half of the series. There are also various flashbacks played throughout the series from the viewpoint of Mahiro related to the case of a main character. She is in fact already dead prior to the series but maintains a strong after-presence with her backgrounds and the mysteries that resulted her death. Plus, there is peach haired princess Hakaze who is crafty, resourceful, and often likes to play mini mind games with the antagonist, and at times with Mahiro and Yoshino. Bored much? Well, probably from being stranded on that island for an extended period of time. In fact, she has her own little secret that gets revealed soon and that itself is a mystery. Nonetheless, the plot twists and various sequences are crafted carefully in order to not go off track and often makes viewers question themselves on what's next. That's where the thriller part comes in. It is thrilling with some of the surprises but at other times, just cliched or even predictable. However, it should be no surprise that Mahiro clearly wants revenge expressed by the look of his face each time his past is reminded. He wants vengeance for his tragic past and he'll stop at nothing to achieve it. Mahiro desire for revenge spells out his determination and what he wants. Yet, there's a point to be said here. Even if he achieves his goal of revenge, the past won't change. The dead don't just get back and walk again. The series maintains a small cast of characters rather than a whole all-star ensemble. The two main male protagonists, Mahiro and Yoshino seems to resemble a reflection of William Shakespeare's famous works, Hamlet and Romeo and Juliet respectively. If we look at it carefully, Mahiro seeks revenge for his tragic past similar to Prince Halmet from the play. Mahiro struggles to avenge the death of his family while at times becomes irrational in the way of him doing things. On the other hand, there's Yoshino who seems to allude the character Romeo. In Shakespeare's famous play, Romeo and Juliet, Romeo loses someone they hold dear to their heart. The result of that loss becomes a tragedy in what seems to be a forbidden love story from his work. Behind the scenes of all this drama is the girl Aika who despite her lack of a physical presence in the series seems to influence it more than anything. Although she doesn't technically make a physical appearance in the show in its present storyline, viewers can clearly see that she is a special individual to both the main protagonists. As a matter of fact, even Hakaze is curious about her (despite not seemingly know who she is) after being acquainted with the main protagonists. From my viewpoint, Aika seems to represent a girl with a mysterious personality with a manipulative state of mind. The antagonist of the series, Samon also has a mysterious way of doing his things. In particular, he seeks out the Tree of Exodus with his clan but at the same time seems to want to prevent the destruction of the world with his own ideologies. Behind that suit also seems to lie an insecure individual even with the protection of one of the most elite of those mages from the series. As being action, fantasy, and shounen all at once, expect some action throughout the series. The way is presented is in a magical way that although lacks strategy focuses more on morality even doing the occasional dialogues between the fight scenes. However, this doesn't last too long. The fight scenes are significantly toned down later on and hell, even eradicated later on from the show. It goes from action packed to lengthy dialogue that almost seems like reading a textbook. The certain shift of sequences from saving the world to speeches toned me off a bit especially when one moment, there seems to be cool action with an apocalyptic presentation. Then, the next moment it shifts to long dragged out speeches about morality, identity, and more mysteries. The speeches themselves seems to be a bit confusing and not surprisingly enough has Mahiro voice his desire to take revenge AGAIN. The way the characters speak in some of the later dialogues also seems repetitive and digs a bigger hole to the mystery itself with more and more bizarre revelations. In terms of artwork, Zetsuen no Tempest has a well crafted image of portraying its various scenes. The art directors makes most of the visuals appealing that gets to the point with the themes of the series. In fact, most of the palates and crafted visuals represents the civilization, the tragic scenes, flashbacks, paradise, etc. The characters' designs are also visually represented well especially Aika who has a sense of beauty in her manipulative ways. The series even attempts some jokes with its visuals such as the snickers bar. There some bits of fan service mainly involving around Hakaze by the way she dresses on the island during wet days. But it's really not too much in my opinion. The soundtrack of the series has many Shakespearean like rhythm to them. It should not be a surprise though given the themes of the series. Kazuhiro Wakabayashi (Soul Eater, Wolf's Rain, xxxHolic) orchestrates many of the music scores well and develop that sense of mysterious atmosphere in many episodes. In fact, the eerie soundtrack and factors with the dialogues matches well with the rhythms. The opening song, "Spirit Inspiration" by Nothing's Carved In Stone from the first half has a strong representation in the sense of what the series may be potential be about. All the main characters as well as some of the supporting characters are presented along with potential conflicts. The first ED song, “happy endings" is presented by Kana Hanazawa who does quite a nice job with her voice. The song shows many of the more metamorphic images involving the main characters as well as the butterflies as seen throughout many times in the series. She also happens to voice one of the main characters in the series, Aika. All in all, Zetsuen no Tempest represents a modern style mystery with some ancestry blood of William Shakespearean work bought to life. The life of one of the main characters no longer exists and that set off many of the conflicts. The conflicts from this series are quite a twist with the various plot holes and surprises. It can be thrilling even with the dialogues but at times, it can also be a bit bothersome. It's a mysterious series to me and should be considered a watch.